Although Rocco Baldelli's time as a player was cut short by physical ailments, his career in baseball was only beginning to take off. 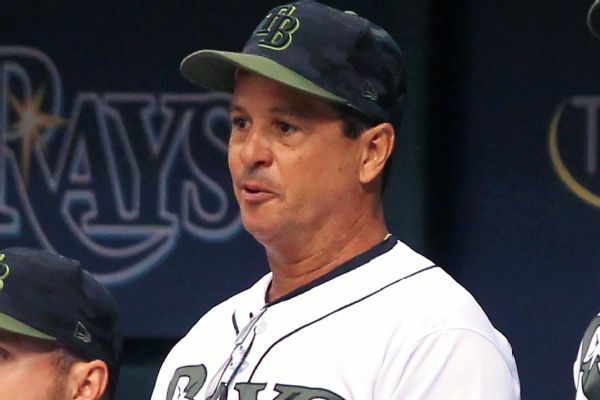 The former Tampa Bay Rays player, assistant and coach will be a first-time manager, the first in the major leagues born in the 1980s. He replaces Paul Molitor, who was fired after four seasons with a 305-343 record. "I like to have fun. I like for the players to love showing up to that environment, to that clubhouse," Baldelli said, adding: "I feel like when guys are relaxed and having fun out on the field, they play their best." Baldelli spent the past four years on the staff of Rays manager Kevin Cash, the first three as first-base coach. His role for 2018 was a newly created position called major league field coordinator, helping Cash and bench coach Charlie Montoyo with in-game strategy, working with the outfielders and focusing on the continued development of the team's young players. Montoyo was hired as manager by Toronto on Thursday. "He connects exceptionally well to people. His humility, his open-mindedness, but also there's a strong sense of opinion there. He has a lot of ideas as how to help players," said Falvey, who is just 35. "He's going to meet one-on-one with guys and find opportunities to enhance whoever they are as a player. I think that's what today's manager needs to do," Falvey said. "They need to connect to each player on an individual level." "One thing Jake really said that stood out was players want to come to him to learn about what he's thinking about their game," Falvey said. "That's about as resounding a statement as you're ever going to hear." Whether or not the 62-year-old Molitor could have done more, the 2018 season was a mess for center fielder Byron Buxton and third baseman Miguel Sano, the two players long groomed to be the franchise cornerstones. The Twins finished 78-84 after making the American League wild-card game in 2017. Buxton, 24, was again affected by injuries and struggled anew at the plate, so much that he spent the last four months in Triple-A. Though Buxton won a Gold Glove Award in 2017 and has 46 steals in 51 career attempts, his on-base-plus-slugging percentage is just .672 in 306 major league games. Sano, 25, also had a career-worst season in 2018 after making the All-Star team the year before. He spent six weeks in the minor leagues for a midseason reconditioning of his work habits and hitting approach and struck out 115 times in 299 plate appearances with the Twins. Hit The Bull, Get A Job? Five former skippers of the Durham Bulls now have major league managerial positions for 2019. Prior to joining the coaching staff with the Rays, Baldelli was a special assistant in the front office of the team that drafted him sixth overall in 2000 out of high school in Rhode Island. Baldelli debuted with the Rays at age 21 in 2003, finishing third in the AL Rookie of the Year Award voting after batting .289 with 51 extra-base hits and 27 stolen bases. He picked up the nickname "Woonsocket Rocket" for his birthplace city and his speed on the field. The only year as a professional he spent apart from the Rays was 2009, when he played in 62 games for Boston. In 2008, he drove in the go-ahead run for the Rays in Game 7 of the American League Championship Series against the Red Sox and homered in Game 5 of the World Series the following week. Injuries hounded him for most of his career, however, and a rare disorder that caused muscle fatigue ultimately forced him to retire after the 2010 season. Baldelli will be the 14th manager for the Twins since the franchise relocated from Washington in 1961, and only their fourth manager since 36-year-old Tom Kelly took over in 1986 and their first manager hired outside the organization since Ray Miller in 1985. Cash, who is 40, is the next-youngest manager behind Baldelli. The Twins under Falvey and Levine over the past two years have dived much more deeply into the data-driven era of the grand old game, with a particular admiration for what the Rays have pioneered. They hired Rays pitching analytics expert Josh Kalk as a senior analyst before the 2018 season, during which the Twins began copying Tampa Bay's experiment of starting games with relief pitchers to maximize matchup advantages. "The people there have prepared me to do anything, and I feel like that," Baldelli said. "They've counseled me. I'm talking about personal things on top of baseball things. They prepared me in every way to feel confident in myself to go out in the world, whether it's in baseball or not, and do whatever it is that I want to do."